This massage oil is a top treat for both expectant and new mums alike. This natural massage oil is packed full of nourishing, vegan ingredients and essential oils that will support your skin throughout your pregnancy. 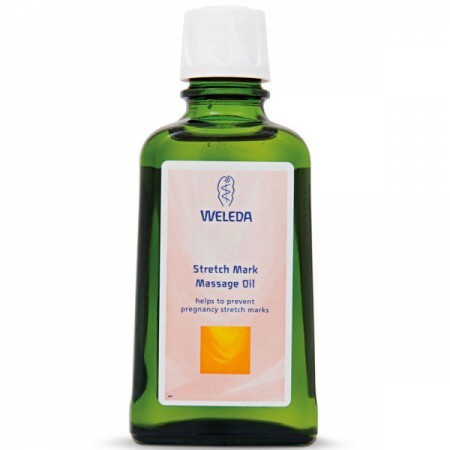 Organic oils, arnica and vitamins A, D and E will help to prevent stretch marks from forming and will soothe and replenish post-partum bodies too. Delicate rose, nerolie, myrrh and frankincense provide a delicate scent that will help you unwind. Throughout your pregnancy and while breastfeeding, massage into your skin on your stomach, thighs, breasts and bottom to boost skin elasticity, prevent and reduce stretch marks. Ingredients: Prunus Amygdalus Dulcis (Sweet Almond) Oil, Simmondsia Chinensis (Jojoba) Seed Oil, Triticum Vulgare (Wheat) Germ Oil, Fragrance (Parfum)*, Arnica Montana Flower extract, Limonene*, Linalool*, Citronellol*, Geranoil*, Citral*, Eugenol*, Farnesol*. *From natural essential oils. Weleda have been making natural body care products, cosmetics and medicinal treatments that gently care for the mind, body and soul since 1921. Weleda UK products are made from start to finish in Derbyshire – from the growing of plants to packaging the finished product. Ethical and sustainable to the core, their products are made without artificial additives, preservatives or colours and nothing is ever tested on animals. Whether you’re a mum-to-be in need of pampering, looking for gentle products for your newborn or buying natural goodies for all the family, we have everything you need from Weleda here at Babi Pur.